I have a simple adjustable power supply (1.8V - 16V / <1A) that I put together with an LM350, works great for the various small bench-top things I use it for. Typically on a load being applied, I see the typical small voltage drop as current spikes, all expected. Last night I hooked it up to a hacked together transistor-as-audio-amp circuit I threw together on a breadboard to test the DAC on a new MCU. Eveything went as expected, sound played fine, but I noticed that my voltage went from 8.4V to 9.75V, around a 16% increase! I'm not completely new to building low-ish power circuits, but I'm trying to get better at the theory, and I'm not seeing why this increase occurs. It is constant, not a spike, and a jump of 1.35V seems like a lot. Of course using a BC547 as an audio is non-optimal, and the transistor only does an ok job handling the current, but I only turn the circuit on for a few seconds at a time. I was thinking that there is some transistor-related phenomenon that I am unaware of that would account for the voltage, but it does occur in circuit simulators, which leads me to believe that it's a real parts vs ideal parts phenomenon. Can anyone point me to a source for understanding why this happens? Probably you don't have a large enough capacitor on the output of your regulator to keep the voltage relatively steady. Try something like 1000uF. The capacitor gives the relatively sluggish regulator time to catch up. Your peak current could be relatively large- 8.4V/4 ohms is over 2A so the transistor will be limiting. Note also that the regulator cannot sink current- it can only source it- so without some kind of passive load (called preload in the regulator datasheet) the regulator will tend to err on the high side. A capacitor will smooth it out so that's less of an issue. Also check for high frequency noise from the audio transistor. Even with a large bypass capacitor, if your audio circuit is generating a lot of noise, that can also affect the feedback loop of the regulator. You could even consider adding some smaller capacitors (like 0.1u or 0.01u) in parallel with your large electrolytic cap to help with noise suppression. You have inadvertently created a bit of a boost converter! 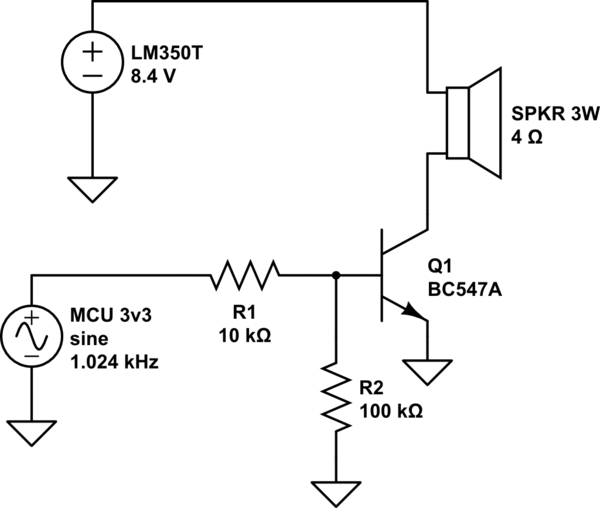 Look at a generic boost converter circuit and recognize that your speaker is the inductor. The LM350 will not sink current by itself. Not the answer you're looking for? Browse other questions tagged power-supply transistors voltage-regulator audio or ask your own question. BC547/BC548 with 5V at base can't control 12V at collector-emitter?